Today started like all other days of our trip. We slept as late as we could (5am for me, 8am for the kids) and had planned to eat a nice breakfast before grabbing a taxi to the bus station in Cuernavaca. Little did I know, my body had other plans. 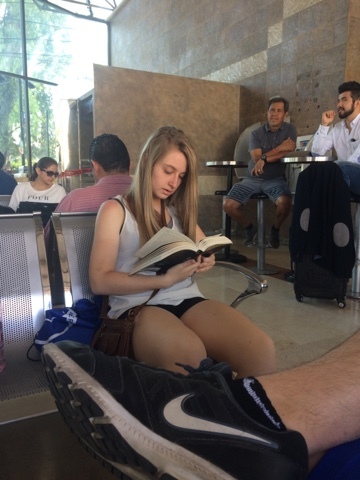 If you don’t want to hear about Traveler’s Diarrhea or E.Coli bacteria, STOP READING THIS POST NOW! Ok, for the brave ones who are still reading, I am going to give you a firsthand description of my first experience with Montezuma’s Revenge. This is my 5th trip to Mexico and I have never been sick (other than some mild stomach cramping that could have been related to something else). I do practice some “risky behaviors.” I brush my teeth with local water and I politely accept foods prepared for me in places I think are safe (I.e. Home stays, hotels, known restaurants and reputable grocery stores). However, I don’t eat street food and as much as it kills me, I don’t buy freshly peeled fruits or hand squeezed juices on the streets. Well, none of that matters when you wake up with diarrhea. At first, there were no cramps, just an urgency to go to the bathroom. Then again 15 minutes later. And again 15 minutes later. I didn’t want to worry Marilu so we ate breakfast, packed up and got a taxi for the bus station. 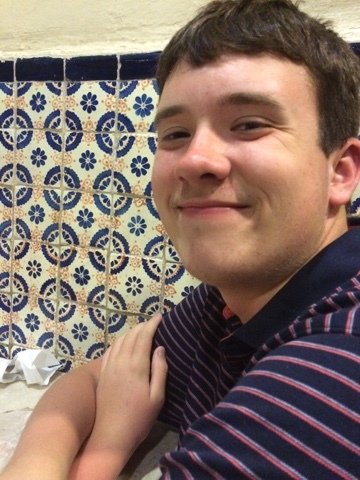 During this time, I was rarely out of the bathroom for more than 30 minutes at a time. 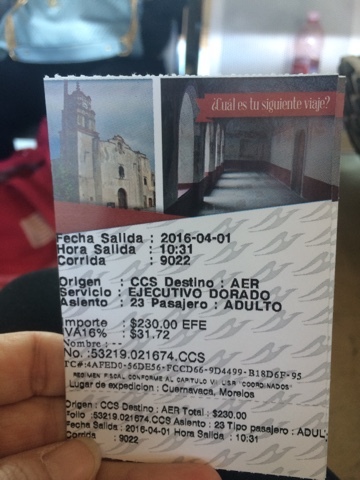 We purchased our bus tickets and fortunately, only had to wait 20 minutes before our bus departed for Mexico City. Certainly, I could handle a 90 minute bus ride, right? Our tickets to Mexico City. Anna waiting for the bus. Who-Dey on the bus with us! I was wrong about being able to handle the bus ride. Not only was I physically sick with stomach cramps, but I also had exteme nausea and light-headedness. Kevin was a great nurse. He rubbed my back with water bottles to try and stop my sweating and to try and keep me from vomiting. There was a bathroom on the bus, but I was determined NOT to use it. I sat counting the seconds until we arrived at our hotel. It was the longest bus ride of my life, but we made it! All I could think of was getting into bed. We are staying at the Courtyard Marriott Hotel at the airport for two nights. Our flight leaves super early on Sunday morning, so I wanted to eliminate and potential traffic issues by being close to the terminal. This hotel is more modern than any US Marriotts that I have visited. The doors and elevators are all controlled by a touchcard system. The staff is extremely attentive and they have a few English language channels. I will say that the kids have not had much exposure to English at all on this trip. We have been to places that Mexicans visit, not Americans. Very few people we have met have spoken to us in English. That is one of the things I like about coming here as opposed to the coastal resorts where speaking in English is the norm. Since I was still very sick, we rested in the hotel room for a bit. The kids were hungry so I gave them my permission to charge the room for lunch. They went to the hotel restaruant and handled the entire meal like pros. No English used! They kindly brought me a club sandwich which tasted good. 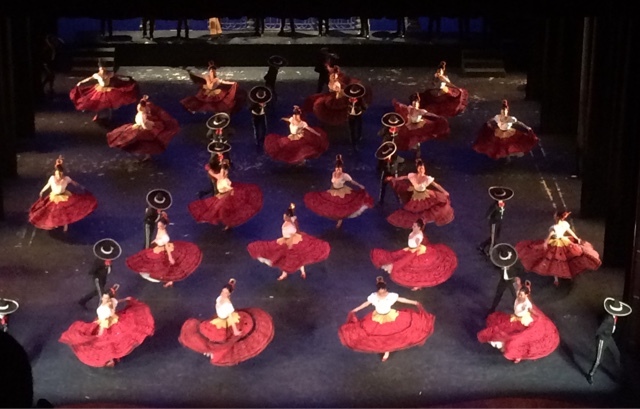 I was still in the bathroom every 30 minutes, but we had tickets at the Palacio de Bellas Artes for the Ballet Folklorico and I didn’t want them to miss it. We grabbed an Uber and made our way back to the center of town. 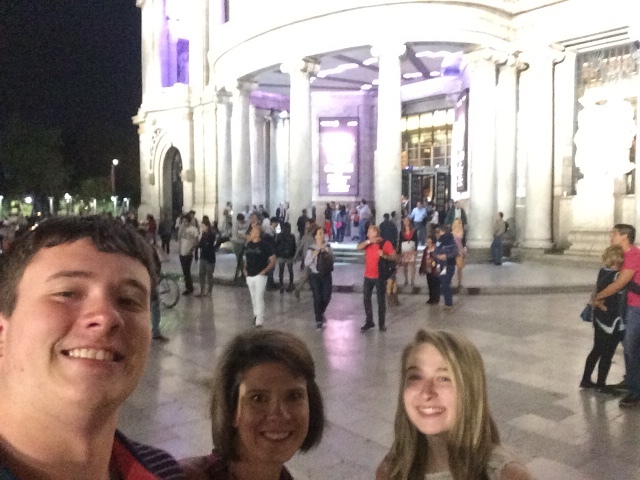 The picture below was taken at the Palacio when we arrived and the other pictures are of the performance. Apparently, everyone takes photos during performances, even flash. We were so surprised at this behavior, but decided to take a couple of pictures to help remember this performance. 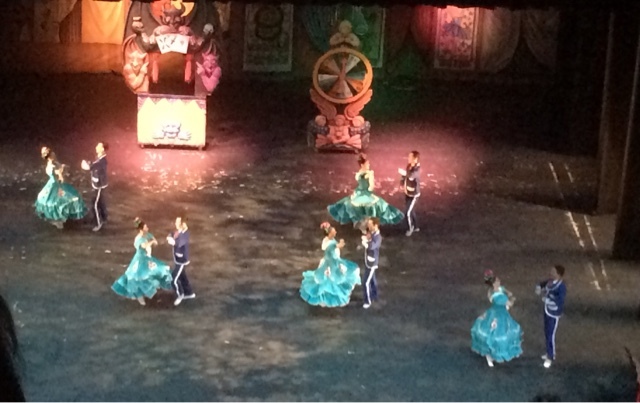 It was 90 minutes of traditional Mexican music and dance. The music was incredible and the costumes were gorgeous. We felt that it was a tad on the long side (probably because we didn’t know much about the different dance styles or costumes), but overall we enjoyed it. Anna started feeling sick and was running a fever by this point and I was still feeling very weak and having cramps every half hour. My bathroom trips had spaced out to every 2-3 hours. I made a point to drink as much as I could and prayed that things would continue to improve. With Anna, we tried Motrin not knowing if she was starting to experience symptoms of traveler’s diarrhea or if she was developing a sinus infection. Her allergies have been very bad here and probably would be at home if we were there right now. Spring is spring everywhere, I guess. By the end of the performance, we were stable so we continued with our plans for the rest of the night. 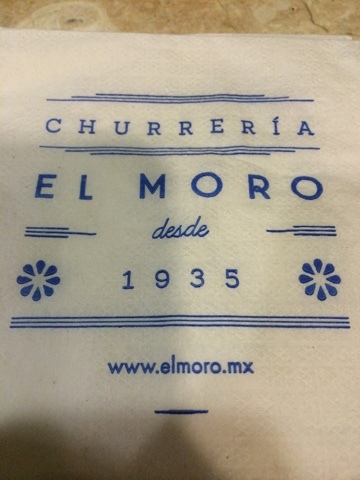 After the performance, we walked down the street to a place called El Moro. 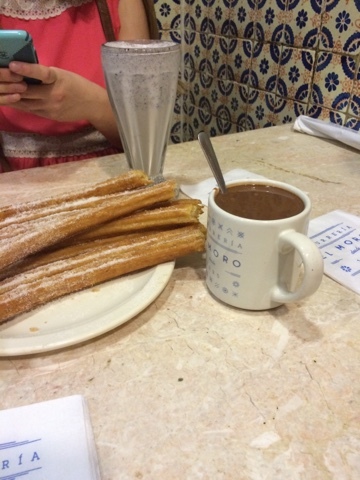 This is a place that only sells churros, hot chocolate and malts. 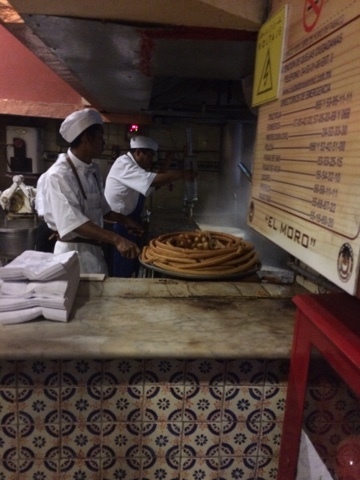 For $4.00, you get four freshly made churros and a cup of hot chocolate. There are about 10 varieties of hot chocolate. 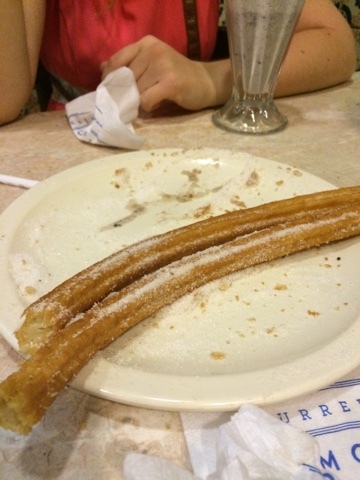 Kevin chose the Spanish kind which was very thick. 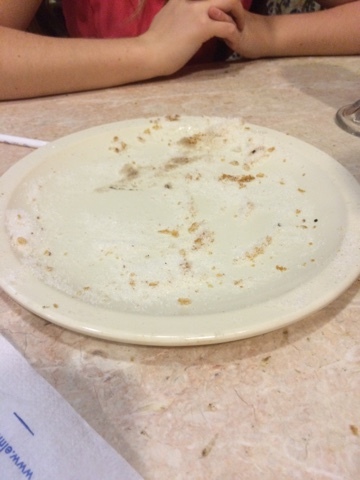 I had the “especial” which had flavor of caramel. 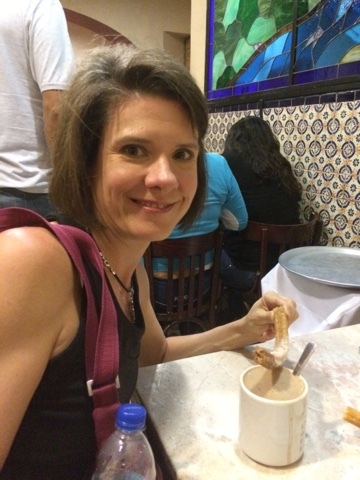 Anna opted for an Oreo malt to go with her churros. This experience was definitely a highlight of our trip! Keeping our fingers crossed for a peaceful night of sleep and recovery! If all goes well, we have a big final day planned tomorrow.